The medals have changed…a bit (1994 vs. 2013) Image credit: Disney Parks Blog. January 2015 will mark the 22nd running of the Walt Disney World Marathon, the flagship event of the runDisney endurance event series, which includes eight race weekends spread across both Disneyland and Walt Disney World. Since its inception in 1994, the race has grown tremendously, both in participants (from 5,588 to a total of 24,000*) and duration, with 5K, 10K, half marathon, and marathon distance races offered on consecutive days – along with a variety of additional endurance challenges. Although next year’s event is sure to sell out quickly (regular registration opens today, April 22, at noon Eastern, visit this page to sign up), you may be surprised to hear that these events were not always as popular as they are today. In fact, in 2011, registrations were at such a low number (under 50 percent by the summer of 2010) that Disney announced a special “Marathon Monday” incentive, which would give all 26.2 finishers free admission to the Disney parks – a perk that has not resurfaced since, much to the chagrin of many runDisney participants! 1994 – Sunday, January 16th – the first running of the Walt Disney World Marathon! This race took participants through all (three!) theme parks. Additionally, Alevtina Naumova of Russia, sets the (still-standing) women’s course record at 2:34:47. 1995 – Leonid Shvestov, of Russia, sets the (still-standing) course record at 2:11:50. Additionally, the course was changed to include mileage through Disney’s Blizzard Beach Water Park. 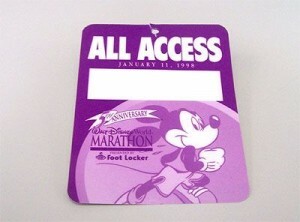 Another perk of the 1995 WDW Marathon? Race Organizers were given 75 spots to the Centennial Running of the Boston Marathon – 22 to the all age-group winners, and the remaining issued randomly to finishers (there was no elite division for the 1995 running). 1996 – marked the first year that race results are measured with electronic timing. 1998 – the 5th anniversary of the WDW Marathon and Inaugural Donald Half Marathon takes place, as well as a corporate relay option, in addition the full marathon. For the next eight years, the half marathon will take place on the same day as the marathon. The theme of the race that year was “Herculean Entertainment,” though the costs were quite the opposite ($50 for the full marathon, and $25 for the half). 1999 – following the first opening of a new Disney Park since 1989, the course was re-designed to include time in the new Disney’s Animal Kingdom theme park. 2003 – the 10th anniversary of the WDW Marathon and the first year a local resident, Bea Marie Alitieri, of Clermont won the women’s marathon with a time of 2:53:10. 2006 – marked a big change in WDW Marathon Weekend, when the half and full marathons were separated into Saturday and Sunday…an action that spurred the inaugural Goofy “Race and a Half” Challenge, which involved running both the half and full marathons, two days in a row. 2010 – marked the largest participant field (55,000) as well as one of the coldest temperatures on record (the race began in the low-30’s). Additionally, this year marked the introduction of new “more magic” options, including a Pre-race Pasta Party and a Post Race Celebration at Epcot. 2011 – this was the year of “Marathon Monday” – and also marked the first time that participants were able to vote for the medal design. Additionally, Fredison Costa beats fellow Brazilian Adriano Bastos in the marathon, ending Bastos’ eight-marathon winning streak, which he began in 2003. 2012 – the first (and last) running of the Walt Disney World Chip and Dale Marathon Relay took place this year. Additionally, this year was the 15th anniversary running of the Donald Half Marathon. 2013 – the 20th Anniversary of the Walt Disney World Marathon – this year, the course was changed to include a lap around the Walt Disney World Speedway, and some mileage at the ESPN Wide World of Sports. 95 “Perfect” Marathon runners were also honored, having completed the race 20 consecutive times. Additionally, this was the first year that women outnumbered men in the marathon (57 percent). 2014 – the introduction of the Inaugural 10K and Dopey Challenge (5K, 10K, 13.1 and 26.2), as well as capacity reductions (in response to crowding concerns), the additions of more race corrals, and gender-specific sizing for participant shirts. 2015 – will mark the 10th anniversary of the Goofy Challenge, and (of course) features an updated medal, which was announced shortly before early registration for 2015 began. With more than two decades of miles and memories, the Walt Disney World Marathon continues to inspire and attract a variety of participants from all corners of the globe. As the runDisney brand expands its offerings, it’s interesting to see what the future holds for this race weekend. 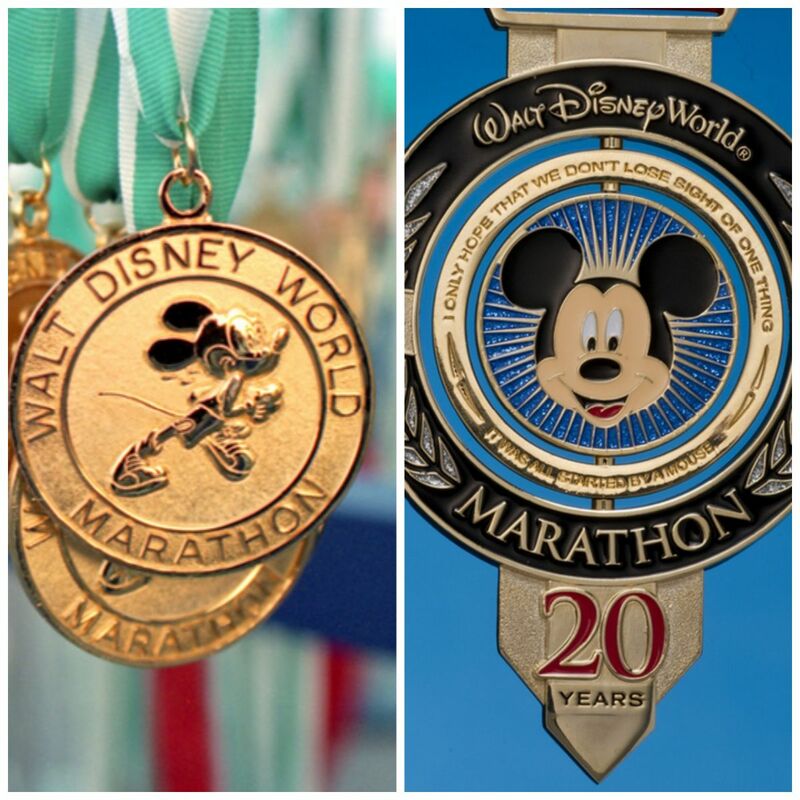 Have you ever participated in the WDW Marathon? What did we miss in our retrospective? Share your stories and memories with us in the comments. * 24,000 runners were registered for the 2014 Walt Disney World Marathon; more than 55,000 participated in weekend race events. Nice retrospective! Highly recommend staying at BoardWalk Inn or BoardWalk Villas during WDW Marathon weekend. Even if you’re not running, it’s exciting to be a part of the event by simply stepping outside and seeing the runners dash by to the finish! Great post! I’m trying my first full this January – it was interesting to see the evolution of the race! Thanks for the registration reminder. Now to work up the courage to register. great recap! I didn’t know most of this and so it is great to learn it all. I am signed up for Dopey 2015 and so pumped!